Map from page 7 of brochure entitled "Ten Thousand Times Around the World: How 17 Years' Experience Made Possible the Story of the Clippers At War"
This item is part of object asm03410013230001001. To request this item, use this number to search for it in UM Libraries' Digital Collections. 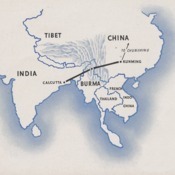 Pan American World Airways, Inc., “The air route known as "The Hump",” UM Libraries Digital Exhibits, accessed April 22, 2019, http://scholar.library.miami.edu/digital/items/show/1830.